The Franklin Park Zoo is a 72 acres (290,000 m2) zoo located in Boston, Massachusetts. 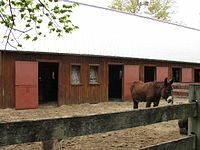 It is currently operated by Zoo New England, which also operates the Stone Zoo in Stoneham, Massachusetts. The zoo is located in the northeast portion of Franklin Park, Boston's largest park and the last component of the city's famed Emerald Necklace. The zoo was opened to the public in 1912, and managed by the City of Boston until 1958, when the Metropolitan District Commission (MDC) took control. Under the MDC's management, the zoo opened several new exhibits, including Bird's World (c. 1975), the Children's Zoo (1984), and the African Tropical Forest (1989). In 1991, the zoo's management was handed over to the Commonwealth Zoological Corporation (CZS), which also gained management of the Stone Zoo. (In July 1997, the CZS was renamed Zoo New England to "reflect the changing image of both zoos".) The zoo has been accredited by the Association of Zoos and Aquariums (AZA) since 1990. Frederick Law Olmsted, the original landscape designer of Franklin Park, created plans for a future zoological garden. This plan, however, was to be a naturalistic area for native animals, rather than a traditional zoo. The Franklin Park Zoo officially opened to the public on October 4, 1912 (although most sources say 1913). According to plans by Arthur A. Shurtleff, the new zoo represented a major departure from Olmsted's original plans, and included more exotic animals. However, Shurtleff's design for the zoo was modest and was intended to be in harmony with key elements of the plan, such as a half-mile long grassy mall called "the Greeting", which began at Peabody Circle. The zoo was managed by the Boston Parks Department, was free to all, and extremely popular. An estimated two-million people visited the zoo in 1920. Unfortunately, the zoo fell into disrepair starting around the time of the Depression and through World War II. In 1958, the Metropolitan District Commission (MDC) took control of the Franklin Park Zoo. The MDC put up fences and gates and started charging admission to the zoo, and areas of the zoo that were difficult to take care of, such as the elephant house and the Bear Dens in Long Crouch Woods, were separated from the zoo property and left to deteriorate. Soon afterward, the zoo received its first professionally trained zoologist to serve as its director, Walter D. Stone. An animal hospital, administrative buildings, and the Children's Zoo (opened in 1962) were also added. In 1970, the Boston Zoological Society assumed some, but not all, management of the zoo, while the state continued to provide funding for the facility. In 1973, a new $24 million master plan, which would "recommend replacing 'the Greeting' with new zoo exhibits", was formulated to revitalize and expand the facility, and included several new domed pavilions, stressing an African theme. Construction began in 1978, but the process was prolonged due to inadequate funding and political complications. On July 1, 1984, after extensive renovations, the 3-acre (1.2 ha) Children's Zoo was reopened; around this time it became the zoo's most popular exhibit. After eleven years of construction at a cost of $26 million, the new African Tropical Forest Pavilion opened on September 9, 1989. The zoo was finally accredited by the American Association of Zoological Parks and Aquariums (AAZPA) in 1990. At the time, it was the only zoo in the nation to be run by a state government (besides the Stone Zoo). After accreditation, the zoo's attendance jumped to 200,000. The number of visitors, however, would continue to fluctuate over the next few years. In 1991, Franklin Park Zoo's management was handed over to the Commonwealth Zoological Corporation (renamed Zoo New England in July 1997). This private, non-profit corporation also took over management of the Stone Zoo, which would reopen in June 1992 after being closed for 18 months due to state budget cuts. In the late 1990s, many new exhibits were built, including Bongo Congo (1997), Outback Trail (1998), and Butterfly Landing (1998). Also at this time, the zoo faced many problems, including multiple budget cuts and dwindling attendance. The zoo is now doing well financially and continues to grow, due to the kindness of many supporters. The 2011 movie Zookeeper, starring Kevin James, was filmed at the zoo in 2009, and was screened at the zoo on June 28, 2011 as a charity event. The zoo contains more than 220 species of animals and includes the following main exhibit areas. The Tropical Forest (known as the African Tropical Forest from 1989 to 1997), a 3-acre (1.2 ha) building roofed by a huge Teflon-coated cloth dome. The building mimics the animals' natural environment with streams, moats, faux-rock structures, hidden fences and barriers, and free-flight birds. The exhibit includes gorillas, bats, dwarf crocodiles, ocelots, ring-tailed lemurs, capybaras, pottos, Baird's tapirs, vultures, de brazza’s monkey, cotton-top tamarin and two pygmy hippopotamus. This exhibit was included in the zoo's 1973 master plan, and was originally intended to house only African tropical species; however, more South American and Asian tropical animals began being displayed in the Tropical Forest by the late 1990s. One gorilla named Little Joe escaped his enclosure several times in 2003. He was later separated from the gorilla family, but later returned in 2007. Also in 2007, the zoo's gorilla exhibit was reopened after extensive renovations. As of 2011, a male giant anteater named Jockamo resides in the former warthog enclosure. Serengeti Crossing (known as Bongo Congo from 1997 to c. 2003), a 4-acre (1.6 ha) grasslands exhibit with ostriches, Grant's zebras, warthogs, crested porcupines and white-bearded wildebeests. The exhibit first opened in 1997, making it one of the first new exhibits to open at the zoo since the opening of the African Tropical Forest in 1989. Reconfigured to 1.25 acres in 2018, adding a new path and entry garden. The observation decks that once overlooked this exhibit have been removed. Kalahari Kingdom, a large Africa themed area housing two male African lion brothers. Visitors can view them through a replica of a land rover "crashed" into the exhibit, glass, or from over a moat. The opening of this exhibit in 1997 marked the first time lions had been exhibited at the zoo since the old Lion House was closed in the early 1970s. Other animals included are sibling male white and female normal colored tiger red river hog, bongo, kori bustards, domestic bactrian camels and African spurred tortoises. Outback Trail, where visitors can view kangaroos, cockatoos, emus,and two North Island brown kiwis. This exhibit opened around 1998, the same year the Butterfly Landing exhibit first opened. A seasonal budgerigar aviary offers opportunities to feed and be amongst the budgerigar. Giraffe Savannah, opened in 1999, is a large area containing three Masai giraffes. Seasonally, a group of three, Grevy's zebras stallions can be found coexisting with them. Bird's World, a large building with an Orient-themed exterior containing dozens of bird species in four different environments: swamp, rainforest, desert, and wetlands. Outside, there is a large flight cage, a small flamingo exhibit, an Andean condor aviary, and a waterfowl pond. A three-year old male Steller’s Sea Eagle named O-washi debuted May 2018. This building originally opened in 1912 (the same year the zoo itself opened to the public), and was renovated around the mid 1970s to exhibit birds in more naturalistic environments. Butterfly Landing, a seasonal exhibit containing over 1,000 butterflies in free flight. This large outdoor "tent" also has streams and a waterfall surrounded by numerous plant species. The exhibit first opened in 1997. 'Nature’s Neighborhood' A Children's Zoo that is a three-acre complex which includes a new, walk through aviary with assorted birds, prairie dogs, red pandas, turtles, and reeve's muntjac 'Franklin Farm A barn with paddocks for livestock and a interaction area for goats with various out buildings. Randall Lineback Cattle, Poitou Donkey, American Pony, Llama, Barn Owl, various Chicken species, Nigerian Dwarf Goat, Guinea Hog, Domestic Cat and smaller animals are found here. There is also a spotted hyena exhibit, outside the Tropical Forest, that is not part of any major area. It first opened in 2014. Before, it housed an African wild dog. Also two exhibits, one for siberian crane and another for white-naped crane can be found in the same area. In 2017, Mandrill have left the collection and were replaced by De brazza’s monkey. The zoo's attendance has been rising in the last few years, but has never equalled the numbers when it was free to all. It hopes in the future to have one million visitors to qualify as a regional zoo. ^ a b c "Zoo New England". Zoo New England. Retrieved August 27, 2010. ^ "Currently Accredited Zoos and Aquariums". aza.org. AZA. Retrieved August 27, 2010. ^ a b "Zoo New England – Franklin Park Zoo at Heart of the City". Association of Zoos and Aquariums. Retrieved August 27, 2010. ^ "zookeeper". Internet Movie Database. July 8, 2011. ^ "Franklin Park Zookeepers Wonder What the Animals would say". patriotledger.com. Retrieved July 9, 2011. ^ "Animals". Zoo New England. Retrieved August 27, 2010. ^ "Zoo Map". Zoo New England. Retrieved August 27, 2010. ^ Burge, Kathleen (February 4, 2007). "OK, Little Joe, let's see you get out of this; The steel-enforced gorilla habitat is designed to keep the most rambunctious apes from breaking free". The Boston Globe. p. 1. ^ Rocheleau, Matt (April 1, 2011). "Giant anteater Jockamo to make public debut Saturday at Boston zoo". The Boston Globe. ^ Cass, John (July 20, 2009). "Boston Pride For Zoo New England". TypePad. Retrieved December 6, 2014. ^ Fitzgerald, Michael (July 30, 2015). "How much does it cost to run Boston's cultural institutions? A comparison". TypePad. Retrieved July 30, 2015. 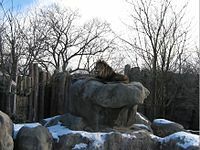 Wikimedia Commons has media related to Franklin Park Zoo.